Paracord (eng. PARAchute CORD, however, it is argued that the word is derived from the German word 'kernmantle') is a nylon of polyester cord with a core. Its most popular application was to produce parachute ropes for the American soldiers during the World War II. Today paracord is used by the military and the civilians as a universal pulling rope. These multipurpose ropes were even used by the astronauts during the STS-82 mission – the second flight of the Shuttle to mend the Hubble Space Telescope. 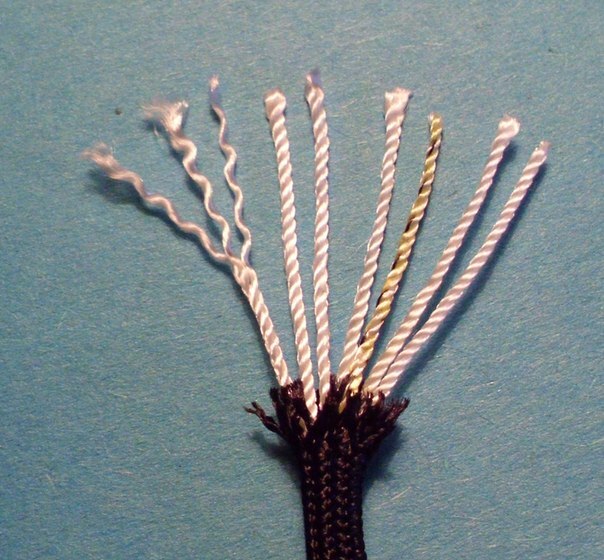 The following paracord types are available: I, IA, II, IIA, III и IV. The following table illustrates the differences between them. Paracord also has a military and a commercial (civilian) versions. Military paracord is marked as "MIL-SPEC MIL-C-5040 Type III" and has 7-9 thread core, each thread consisting of 3 strands. Commercial III type version is the most popular and is widely available. It consists of 2-strand threads in the core and the cladding, which consists of 32-36 interwined threads. Seven internal cords have tensile strength of 50 pound each or a general tensile stress of 350 pounds. The cladding has a tensile stress of 200 pounds. The resulting total is 550 pouns, that’s why paracord type III is often called 550 cord. According to the Americal requirements established for the paracord, the final product should match a range of parameters. Even though these requirements state the thickness of the cladding and core threads, they do not limit the diameter of the cord itself. III type paracord is usually 3-4 mm thick. As it has been stated above, the woven cladding consists of multiple intervowen fibers, which gives it a sleek touch and a wide color range, including whole-colored, two- and multiple colored, or even fluorescent ones. Being 3-4 mm thick it has a tensile stress of 249 kg. It could be used over and over, retaining its flexibility and strength. According to the military specification, the weight of 151-long cord is only 1 kg. The sunlight is not a problem. And the cord takes no time to dry up. The possibility to take the internal strands out makes this cord universal. After the World War II paracord became available for the civilians – first as the military excess and then as a general retail product. The spheres of paracord applications may only be limited by the breadth of one’s imagination. The main thing is to keep in mind the maximum stress and not to overdo it. It is also worth mentioning, that paracord is not designed and strictly advised not to be used for climbing, as its characteristics do not meet the requirements set up for climbing cords. Otherwise, anything at all may be done with it. It may be used complete, or its internal threads may be taken out and used separately. 1. Bracelets, belts, lanyards, etc. Plaiting different items from paracord is a great way to always have a bit of rope on you. Let’s say, you suddenly need to tie something to the roof of your car – all you need is to unwind the bracelet, et voila! It is especially handy for campers and hikers, who can have a bit of rope on them without taking any additional space from the backpack. 2. Dog collars and leads. You can make long dog leads or cat harness, the strength of paracord and its rot-resistance makes it an ideal material for them. 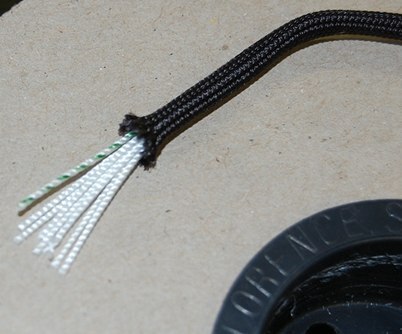 By pulling the opposite paracord ends quick enough one can create the necessary friction and really saw various things. Paracord may be used to set traps for small and medium-sized animals. The internal threads alone may be used as a fishing line. The internal threads are thin enough to sew on buttons, mend the torn clothes or equipment. They may even be used as dental floss! Pacacord has multiple applications in any camping. Thanks to its strength and its rot-resistance it may be used as a tent line, prop fixture and even as a cord to hang the food to keep it away from animals. Making a “fire bow” from of paracord and a stick one can make a fire. Be sure it will not be torn by friction. 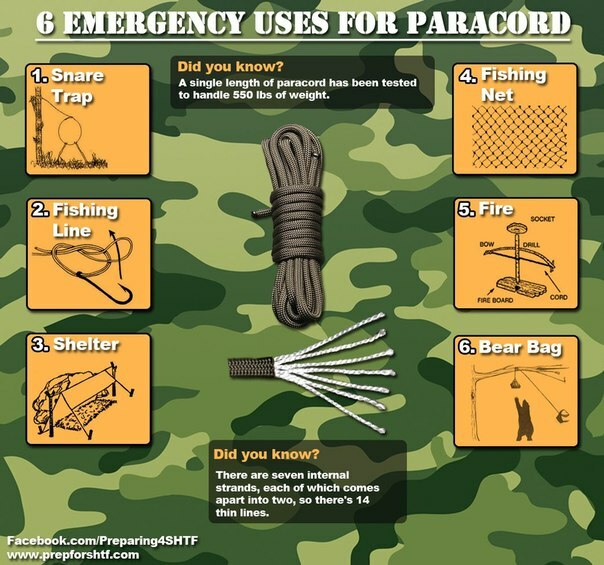 Paracord may be used to provide emergency aid in case of injury. It may be used as a garrot or a belt to fix a broken limb. A handbarrow can also be made of paracord. If the alternator belt of your car is torn on the route, you do not have a spare one, naturally. But you have a paracord bracelet! You unweave it , measure the necessary length, tie a knot every several centimeters (to prevent it from slipping), and will be able to get to the nearest service point. No, paracord is not designed for climbing, but in emergency you can climb up or down the major rope with a help of a loop and a prussik made of paracord. (Bear in mind that the total weight which paracord can sustain is 249 kg). 11. Ferry and block and tackle. You can be sure to use paracord as an additional cord during the setting up of a block and tackle systems or ferries. If you have enough skills you can make braided and wicker items from paracord, including water bottle holders, fishing and hunting nets. If the load you require to move is more than 249 kg, and you have a proper rope at hand, you can make a stronger rope of several pieces of paracord. With 8 plaited paracord pieces of the necessary length you can easily tow a car. Your shoelaces are torn? No problem! If you use paracord you can forget about buying new laces for 5 years at the very least. 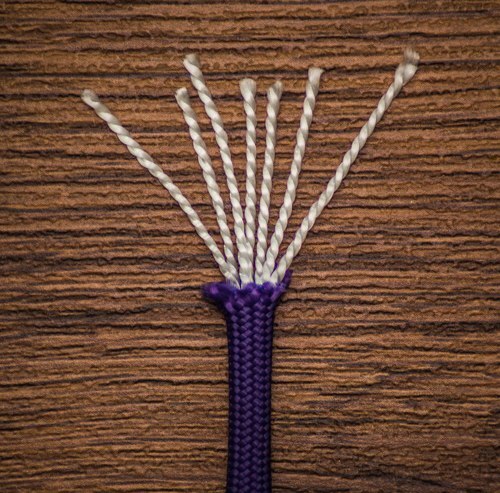 If you know basic rules of paracord weaving and have simple materials at hand you can make simple protective aids. paracord on one of the American factories.